The severe weather during the month led to the cancellation of two of the planned working parties, though we managed to complete the machining and drilling of the pony truck centres. All horn guides and horn blocks are now machined and painted. 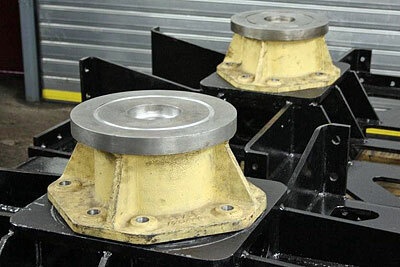 A start has been made on the fabrication of the backing plates for the liners for these items. 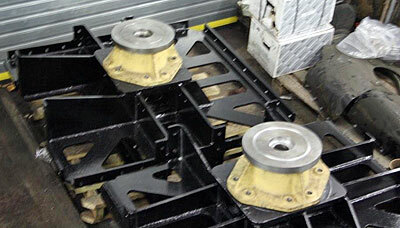 The newly machined pony truck centres in position awaiting fitted bolts to secure each centre to its stretcher. 2010 has been a year of steady progress, with a welcome absence of the Bank and Royal Mail gremlins that afflicted us last year. Let us hope the New Year will continue in the same vein! While headlines in the hobby press have been stolen this year by some other newbuilds at present under construction, we have kept to our original intent, which has always been to build 82045 in a logical, structured, phased progression. The first phase of the project (the frame assembly) is nearing completion as the year draws to its end, and we are confident that we have provided the soundest possible foundation for its continued success and wellbeing. some of the six horn ties have been machined to fit the gaps in the frames. Work not yet complete. smokebox saddle under construction by Dave Hewson. Contract placed for machining it. patterns for several items are complete and ready for a visit to the foundry, e.g. spring brackets, brake hanger support brackets and - most spectacular - the left-hand and right-hand motion brackets. While we are finishing the year with a healthy bank balance, 2011 is expected to bring with it considerable demands on our resources as we start to plan for the driving wheels and at the same time place the order for the pattern for 82045's cylinders. Fortunately, one pattern will do both cylinders, but we are looking at a cost of around £25,000 for the pattern alone - more than the total cost of building the complete no. 82044 in 1955, which seems scarcely credible! Consequently, we cannot relax our efforts to build up our funding base, so please think seriously about joining us. For existing members, please spread the word about 82045 and see if you can recruit your friends for this most practical of causes. Finally, we would like to express our sincere thanks for all the generous support that we have received during 2010, and to promise you all once again that we will continue work at full pelt during the year to come towards completion of the 82045 project at the earliest possible date. A Happy and Healthy New Year to you all!